First let me begin by saying I have such creative friends! Last year when I saw my dear friends dressed in these awesome Lorax costumes I had to snap a picture to then share with my CocktailMom readers. It is such a creative and low cost family costume. For the parents; to make the pom pom tree tops from the Lorax, Sara told me she consulted Martha Stewart's Pom-Pom directions. Yellow construction paper adhered to a black t-shirt completed the look. Easy! 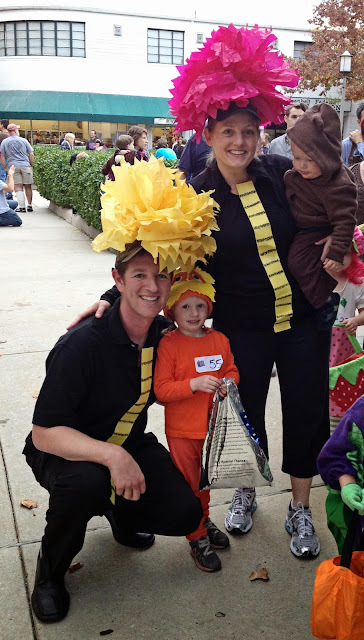 The little girl dressed as the Lorax is wearing all orange and Sara purchased the fleece hat on Etsy. A quick search on etsy and you can find crochet, fleece and all kinds of creative Lorax hats already made if you don't feel like making your own. I imagine that if you can sew a fleece hat you could use felt to make the Lorax eyes and mustache. The wee little one is wearing a bear one piece costume, which can be easily replicated by wearing all brown (top and pants) and a brown fleece hat with tiny ears. What a creative way to go out trick or treating as a family. Thanks creative friends! Happy Halloween!